"Why buy expensive name-brand coffee creamers when it's this easy to make even better tasting ones?" Whisk 4 ounces cream, maple syrup, pumpkin puree, pumpkin pie spice, and vanilla extract together in a microwave-safe bowl. Heat pumpkin mixture in the microwave in 30-second intervals, stirring between intervals, until heated through and completely blended, 1 to 3 minutes. 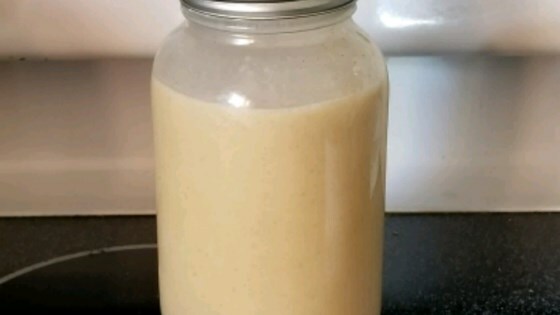 Pour sweetened condensed milk, remaining 10 ounces cream, and pumpkin mixture into a container, cover the container with a lid, and shake until completely mixed. Store in the refrigerator. Definitely needed more pumpkin for me but good start. Once I added a little more flavor was perfect! Better than store bought! I even used half and half instead of heavy cream to cut down on the fat and calories. So easy and so delicious! Really delicious way to enjoy seasonal coffee with real ingredients. I double the pumpkin and the spice. I just put everything in my blender, no heating required.